The common elder, Sambucus nigra, is a great tree or bush for new or nervous gardeners who want something easy to grow, that will still allow them to harvest and use the produce, as it needs very little care and attention. It’s happy in almost any soil type, including clay, sand, and loam, and will even tolerate chalky soils, and will be fine in full sun or part shade. It likes the soil to be humus-rich and moist but well-drained, but then most garden beds and most topsoil will provide that. If you aren’t sure whether you’ll be able to grow an elder, take a look in your local park or in your neighbours’ gardens: if the top soil is suitable, you’ll see one growing somewhere, as there are plenty about. Secondly, you can harvest both flowers and fruit from the elder. 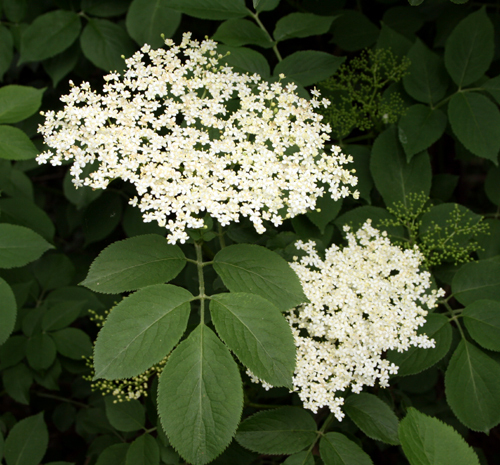 The creamy-coloured flowers appear in spring, and are ideal for making elderflower cordial or elderflower champagne. The berries are only edible if cooked, but make a beautiful jelly. This recipe for elderflower cordial is based on one on the BBC Good Food site. 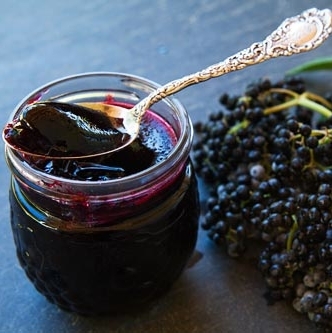 The recipe for elderberry jelly incorporates another staple that ripens at the same time: cooking apples. Rinse the elderflowers gently to remove any dirt or bugs. Pour the boiling water over the sugar in a very large mixing bowl. Stir well and leave to cool. Add the citric acid, orange and lemon slices, and the flowers. Leave in a cool place for 24 hours, stirring occasionally. Strain through muslin and transfer to sterilised bottles. Wash the elderberries. Wash the apples and chop roughly without coring or peeling. Cook the fruits separately in a small amount of water, until they are soft. Strain the combined fruits through a jelly bag or muslin, and return to the pan with 350g / 12 oz sugar to every 600ml / pint of juice. Heat gently and stir until the sugar has dissolved, then boil rapidly until the jelly has set. Test for a set every five minutes by removing from the heat, placing a teaspoonful on a cold plate, and letting it cool, then pushing it gently with your finger. If set, it will wrinkle up a little in front of your finger. Pour into clean, sterile jars and seal immediately. Enjoy on toast, with a glass of your own elderflower cordial!